Shop ’til you drop Memorial Day Sale! Who doesn’t love to shop the Memorial Day Sales? They are a great time to stock up for summer vacations, kids’ camps, graduations or even the school year ahead. 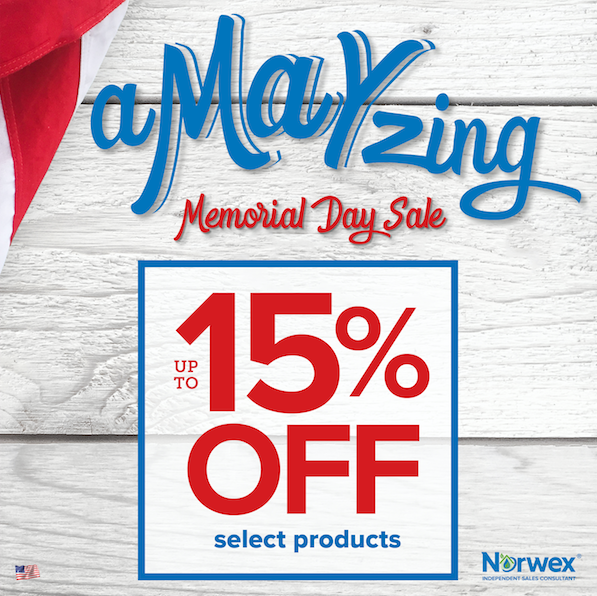 The Norwex Memorial Day Sale starts today and offers fantastic deals on some of our most popular must-haves. So don’t delay. 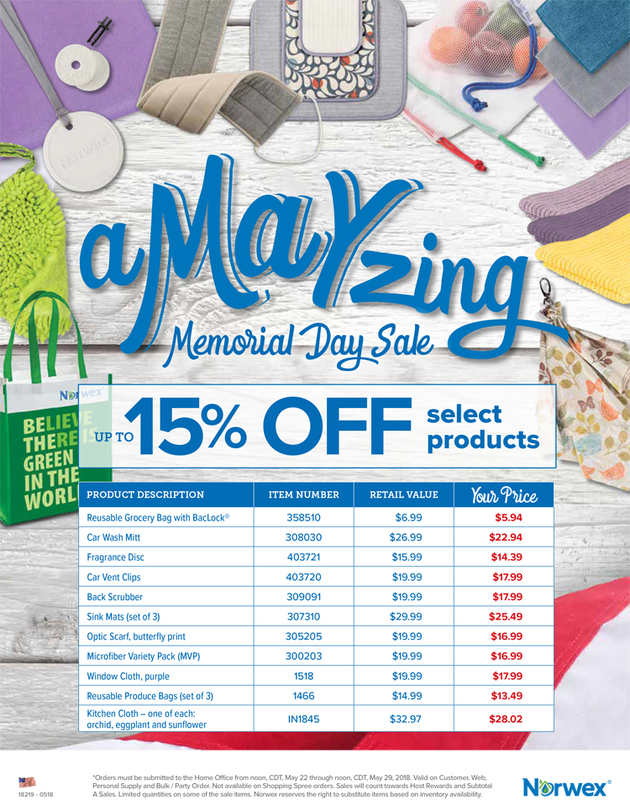 You can save up to 15% on a variety of products from now until noon (CDT) on May 29. Keep your car clean during road trips with a quick wipe down using a damp Norwex Car Wash Mitt for $22.94 (reg. $26.99) and keep it smelling fresh with our Car Vent Clips for $17.99 (reg. $19.99). 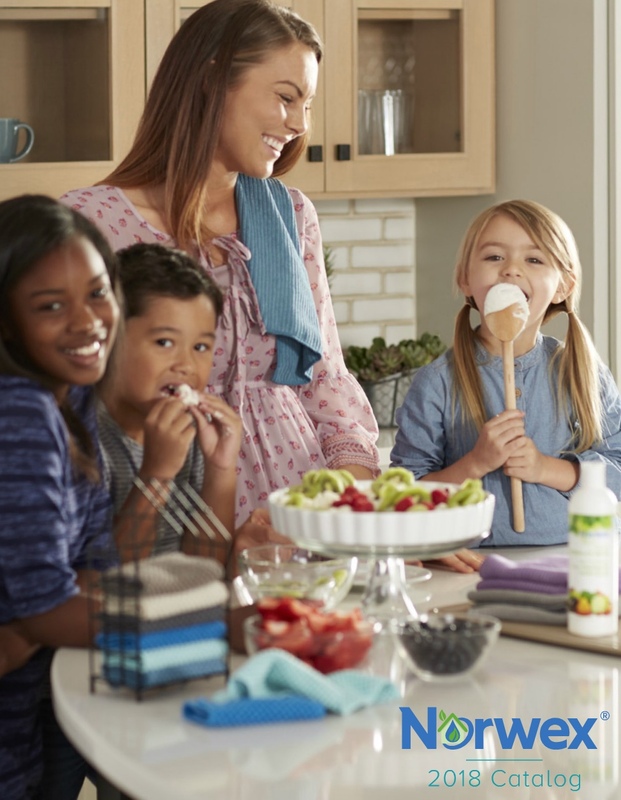 Help your kids keep their spaces and themselves clean at camp or college, by sending them off with the Microfiber Variety Pack, for $16.99 (reg. $19.99) or Window Cloth for $17.99 (reg. $19.99). Or, treat yourself to a kitchen upgrade with our Sink Mats (set of 3) for $25.49 (reg. 29.99) and our Kitchen Cloths for $28.02 (reg. $32.97). These are just a few of the items on sale, see the flyer below for the complete list. Get in touch with me today to take advantage of these offers.